After the dual camera craze, the natural evolution for smartphone cameras is to have a real 3D camera, and Qualcomm is already working on it, showing on mobile devices will soon be able to have an embedded "Kinect". 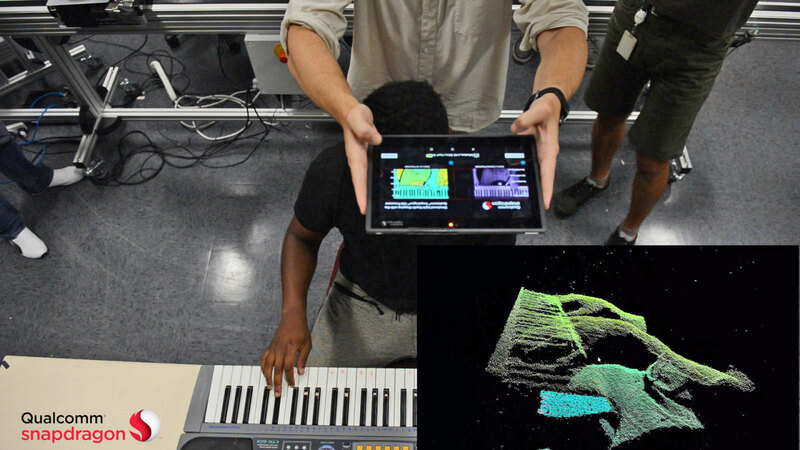 As a part of its Spectra Module Program, Qualcomm provides partners with options for integrating 3D cameras into smartphones and tablets, with the best one offering a system identical to the one used by Kinect, with an IR illuminator that projects a pattern of IR points invisible to human eyes, allowing the system to determine the distance of objects with high resolution and accuracy. Unlike the current two-camera systems, where 3D information is estimated with reduced accuracy (sufficient for things like depth-of-field simulation, but little more), we're talking about real-time 3D depth perception per pixel, which could have a huge impact in virtual reality and augmented reality applications. We should begin to see this module hit the market next year, and the key point will be having a software platform that makes it easy to use it (Google might expand the Tango program to include it, Apple could easily add it to ARKit or a similar API). ... Another interesting module from this Qualtram Spectra family is a front camera for iris recognition that works even when the user is wearing sunglasses.